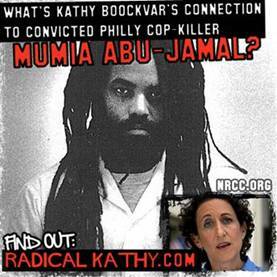 As part of its continuing effort to paint challenger Kathy Boockvar as a liberal extremist, the National Republican Congressional Committee Thursday launched a new attack: robocalls that link the Democrat to convicted killer Mumia Abu-Jamal. A campaign consisting of online ads reminiscent of Willie Horton and hundreds of thousands of robocalls highlights a handful of tenuous links between Abu-Jamal and Boockvar (who was 13 years-old when the former was convicted). Boockvar, running against Rep. Mike Fitzpatrick (R-Bucks), is the top Democratic challenger in Pa. in 2012. The National Republican Congressional Committee’s robocall introduces a message, “about congressional candidate and legal activist Kathy Boockvar and convicted Philadelphia cop killer Mumia Abu-Jamal,” the voice says. The committee is spending a few thousand dollars on the calls. Its claims are laid out on a website created by the NRCC for the 8th district race. Abu-Jamal is one of the most famous (now former) death row inmates in the nation. Convicted of murdering a Philadelphia police officer in 1981, he and supporters long insisted that he was innocent and had been railroaded by the system. The case is a lightning rod for debate over the death penalty, as well as race relations in Philadelphia and beyond. His case bounced around in the legal system for decades before, in 2011, the Philly District Attorney’s office officially withdrew its effort to seek the death penalty. He’s now serving life in prison without parole. Two of the NRCC’s links between Boockvar and the case are tenuous. Overall, the NRCC has a case against Boockvar’s husband much moreso than Boockvar herself. Here are the claims. Claim 1: The husband-and-wife law firm of Boockvar and Yeager has represented one of the leading activists for Mumia Abu-Jamal (1). Verdict: True. Boockvar’s husband, Jordan Yeager, did represent Francis Goldin after the Abu-Jamal activist was arrested during a protest. Boockvar was a managing partner at the firm at the time. Verdict: Misleading. Yeager represented witness Veronica Jones… 14 years after the Abu-Jamal case on an unrelated issue. Correction: Verdict: True. Indeed Yeager was Veronica Jones’ attorney during the 1996 hearing when she recanted her testimony in the Abu-Jamal case. The NRCC’s initial citation leads to a news report about unrelated charges, but court documents archived by an organization which includes late Officer Daniel Faulkner’s wife show that Yeager was involved with the case. Verdict: True. According to an AP report from 1996, Yeager said that prosecute were going out of their way to charge Jones with additional crimes. “It’s a continual effort to intimidate her and a continuing effort to intimidate any other witnesses from coming forward,” he said. Verdict: Misleading; guilt by association. Someone who worked with Boockvar did author this allegation, but their shared employer was the only connection. Verdict: Misleading. Yeager had been a member of the National Lawyers Guild, but had left the group before the event in question. Boockvar Campaign Manager Jon Blair said the calls are an effort to distract from Fitzpatrick’s votes and statements in 2005 when he offered support to some of then-Pres. George W. Bush’s proposals to alter Social Security. “No amount of desperate, meritless accusations will stop the ground that is falling beneath Mike Fitzpatrick’s feet. The concrete facts about Congressman Fitzpatrick’s record are what the voters are making their decision on this year,” Blair said. It’s not the first time Republicans have seized on Boockvar’s liberal background. Boockvar spent years working with the Advancement Project, a civil rights organization that has backed a number of liberal causes. For example, during her 2011 bid for Pa. Commonwealth Court, Boockvar faced a negative television ad over her advocacy of voter registration for ex-convicts. Southeast in Washington, DC 20003, 202-479-7000, with a recorded message about congressional candidate and legal activist Kathy Boockvar and convicted Philadelphia cop killer Mumia Abu-Jamal. This call was paid for by the National Republican Congressional Committee and was not authorized by any candidate or candidate’s committee. (202) 479-7000. I have no opinion/comment in regards to the Mumia case. However, that the NRCC would try to tie Bookvar to this case on these very loose terms is an absolute abomination. The NRCC, perhaps not surprisingly, has stooped to a new low in American political discussion. Disgusting! A lawyer and his or her client must not be identified. Much less the lawyer with the alleged crime of the client. That’s American justice as it’s supposed to be 101 and can be read off directly from the Constitution. The US has close to 2 million lawyers. Does anyyone think that all those people act as lawyers only for those whose values or principles they hold dear or who they think are innocent? The NRCC’s new campaign shows how deep some important forces among the Republicans have sunk even in very elementary matters. If these people gget their way, no one they don’t like or deem guilty will get a decent defense anymore because the lawyer will be held guilty by association. Shame on the NRCC and their anti-Americanism! That said, I write as someone who has studied the material facts of this case as closely as anyone. I’ve written countless articles many of which are available on the internet, and a book of mine on the case was published in German in 2006. As a result of this research, not only do I fully agree with my colleague in “Journalists for Mumia,” Hans Bennett, who says that Abu-Jamal had a “grotesquely unfair” trial (these are the words of a prominent conservative legal commentator, Stuart Taylor), but I will also frankly say that I’m convinced of Abu-Jamal’s innocence. His case was a classical case of a police-and prosecution-engineered frame-up, and the brutal bullying and intimidation of Veronica Jones was an important part of that frame-up, as Hans Bennett shows in a detailed fashion in his previous posting. But those who smear Abu-Jamal and anyone who is associated with him even in the most peripheral way of course do not have time for those details. Why destroy a story one all to eagerly wants to believe with inconvenient facts? But the facts do matter. The constitutionaal right to a fair trial does matter. The constitutional right to counsel, and the constitutional rights to assist the – falsely or correctly – accused does matter. I hope enough people in the United States, a country I always love to visit and come back to and where many of my friends live, will vigorously resist this latest attempt by self-described super-Americanists to shredder another element of that all-American document, the Constitution. –Veronica Jones was at the crime scene on Dec. 9, 1981. She first told police on Dec. 15, 1981, that she had seen two men “jogging” away from the scene before police arrived. As a defense witness at the 1982 trial, Jones denied having made that statement; however, later in her testimony she started to describe a pre-trial visit from police: “They were getting on me telling me I was in the area and I seen Mumia, you know, do it. They were trying to get me to say something that the other girl [Cynthia White] said. I couldn’t do that.” Jones then explicitly testified that police had offered to let her and White “work the area if we tell them” what they wanted to hear regarding Abu-Jamal’s guilt. At this point, prosecutor McGill interrupted Jones and moved to block her account, calling her testimony “absolutely irrelevant.” Judge Sabo agreed to block the line of questioning and strike the testimony and then ordered the jury to disregard Jones’ statement. The DA and Sabo’s efforts to silence Jones continued through to the later PCRA hearings that started in 1995. Having been unable to locate Jones earlier, the defense found Jones in 1996, and, over the DA’s protests, obtained permission from the Pennsylvania Supreme Court to extend the PCRA hearings for Jones’ testimony. Sabo vehemently resisted – arguing that there was not sufficient proof of her unavailability in 1995. However, in 1995, Sabo had refused to order disclosure of Jones’ home address to the defense team. Jones testified that she had changed her version of events after being visited by two detectives in prison, where she was being held on charges of robbery and assault. Urging her to both finger Abu-Jamal as the shooter and to retract her statement about seeing two men “run away,” the detectives stressed that she faced up to 10 years in prison and the loss of her children if convicted. Jones testified in 1996 that in 1982, afraid of losing her children, she had decided to meet the police halfway: She did not actually finger Abu-Jamal, but she did lie about not seeing two men running from the scene. Accordingly, following the 1982 trial, Jones only received probation and was never imprisoned for the charges against her. During the 1996 cross-examination, the DA announced that there was an outstanding arrest warrant for Jones on charges of writing a bad check and that she would be arrested after concluding her testimony. With tears pouring down her face, Jones declared: “This is not going to change my testimony!” Despite objections from the defense, Sabo allowed New Jersey police to handcuff and arrest Jones in the courtroom. Jones’ account was given further credibility a year later. At the 1997 PCRA hearing, former prostitute Pamela Jenkins testified that police had tried pressuring her to falsely testify that she saw Abu-Jamal shoot Faulkner. In addition, Jenkins testified that in late 1981, Cynthia White – whom Jenkins knew as a fellow police informant – told Jenkins that she was also being pressured to testify against Abu-Jamal and that she was afraid for her life. As part of a 1995 federal probe of Philadelphia police corruption, Officers Thomas F. Ryan and John D. Baird were convicted of paying Jenkins to falsely testify that she had bought drugs from a Temple University student. Jenkins’ 1995 testimony in this probe helped to convict Ryan, Baird and other officers and also to dismiss several dozen drug convictions. At the 1997 PCRA hearing, Jenkins testified that this same Thomas F. Ryan was one of the officers who attempted to have her lie about Abu-Jamal. Keegan you apparently are skewed to the left. Jordan Yeager was the attorney for Veronica Jones when she decided to change her story. This was 14 years later and only after Gov. Ridge had signed his death warrant. Kathy Boockvar profited directly as a result of his aid to the convicted cop killers defense. His work helped make a name for him in liberal circles and witht he proceeds from the defense funds they opened their own lawfirm. Not only is Kathy directly tied to Mumia the Cop Killer, she profited mightily from it. My only criticism of your article is that you refer to Mumia Abu-Jamal as “The cop killer,” in the section entitled “Claim 5,” which is essentially adopting the language of those in the GOP who are using Abu-Jamal for race-baiting tactics. Thank you, Keegan, for writing this important article. Your analogy with the “Willie Horton” race-baiting tactic is right on. Let’s hope that this overt appeal to white racism in Pennsylvania will backfire on the Republicans.